An Atlas V rocket has launched with NASA’s Solar Dynamics Observatory (SDO) from Cape Canaveral Air Force Station – a spacecraft intended to study variations in the sun and its magnetic field – at the start of a 60 minute launch window on Thursday (10:23 Local/15:23 GMT), after scrubbing Wednesday’s attempt due to high ground winds. The launch of SDO will mark the 20th flight of the veteran Atlas V rocket – a rocket which has a tremendous success record: only one partial failure which was actually deemed a success by its payload customer, the National Reconnaissance Office. For this launch, the Atlas V will fly in its 401 configuration: no solid rocket motors, a single-engine Centaur upper stage, and a four-meter diameter payload fairing. This configuration is the most frequently used Atlas V configuration, having been used on half of all Atlas V launches. The launch will be conducted from Space Launch Complex 41 (SLC-41) at the Cape Canaveral Air Force Station (CCAFS) – just a few miles from nearby Launch Complex 39A which Endeavour launched from just two days ago. SLC-41 was originally built in the 1960s for the venerable Titan rocket fleet. The first launch from the complex was made by a Titan IIIC in December 1965. The launch pad was later used for Titan IIIE, or Titan-Centaur, launches during the 1970s. This version of the Titan rocket was responsible for the launches of the Helios, Viking, and Voyager probes, among others. Following the end of the Titan IIIE program, SLC-41 was converted for use by the Titan IV, which used the complex between 1989 and 1999. Following completion of this rocket program the complex was reconfigured for use by the Atlas V – which made its maiden flight in 2002. The Atlas V rocket that will be used for today’s launch is designated AV-021 and was assembled – like all other Atlas V’s at the CCAFS – in the Vertical Integration Facility (VIF) located about 550 meters south of the launch pad. The Atlas V, with the SDO mounted on top, was rolled out on Tuesday morning for final launch processing activities. First motion from the VIF was recorded at 08:03 EST (13:03 GMT) and arrived at the pad surface 26-minutes later. The main thrust for ascent of the 401 Atlas V configuration is a single RD-180 engine mounted on the bottom of the Common Core Booster (CCB). The RD-180 engine was developed by the Russian company NPO Energomash and derived from the RD-170 series of engines originally developed for the Union of Soviet Socialist Republic’s Energia and Zenit rockets. Ignition of the RD-180 engine will occur at the T-2.7 second mark with the release of the hold down bolts 3.8 seconds later. Eighteen seconds after leaving the launch pad, the Atlas V will perform a pitch-over maneuver. The rocket will go supersonic 81-seconds after launch and pass through the area of maximum aerodynamic pressure – or Max-Q – 93 seconds after liftoff. At T+4-minutes 3-seconds, the RD-180 engine will be commanded to shut down, an event known as Booster Engine Cutoff, or BECO. Eight retro-rockets will then be used to ensure proper stage separation of the CCB from the Centaur upper stage. These retro-rockets will fire six seconds after the shutdown of the RD-180 engine. Ten seconds after the RD-180 engine shutdown, and four seconds after stage separation, the Centaur’s RL10-4-2 engine will ignite. The Centaur upper stage was originally developed for the Atlas and Saturn programs during the late 1950s and early 1960s. Although it was never used on the Saturn rocket, the Centaur upper stage has been used in conjunction with the Atlas rocket since 1962 and has also been used on Titan rockets. A version of the Centaur was also developed for use by the Space Shuttle Program for satellite deployment missions; however this version of the Centaur never flew due to increase safety concerns following the loss of the Space Shuttle Challenger. 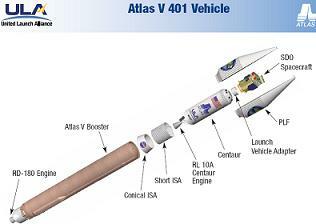 For this Atlas V mission, a white Centaur upper stage will be used – as has been used on the past four Atlas V missions. This white Centaur upper stage, as opposed to the standard orange-colored variant, provides improved thermal protection during the coast phase of the flight. Following ignition of the Centaur’s engine, the payload fairing will separate from the vehicle, exposing the SDO for the first time during ascent. The first burn of the Centaur’s engine will last 11-minutes 36-seconds and will place, placing itself and the SDO into a parking orbit. Eighty-eight minutes later the Centaur will restart for its second burn lasting 3-minutes 15-seconds. This second burn will place the upper stage and spacecraft into a geosynchronous transfer orbit. The SDO will separate from the Centaur 2-minutes 49-seconds after completion of the second burn. Today’s flight will be the 20th launch of an Atlas V rocket and the 10th launch of the vehicle in its 401 configuration. This will also be the 31st launch of an Evolved Expendable Launch Vehicle (EELV) and is the first launch of 2010 for both the Atlas V and the EELV program. 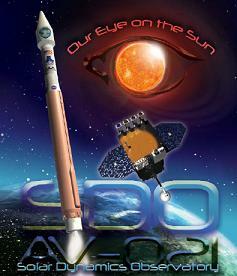 The launch will be conducted by United Launch Alliance and will mark their 38th launch. The Solar Dynamics Observatory represents the first step in NASA’s Living With a Star (LWS) program – a program, according to the Goddard Space Flight Center, designed to “understand the causes of solar variability and its impacts on Earth. The primary goal of the SDO mission is to understand the variations of the sun and the influence of solar variation on Earth’s atmosphere and mankind’s technology. For these observations, SDO’s scientific team will use three instruments: the Atmospheric Imaging Assembly (AIA), the EUV Variability Experiment (EVE), and the Helioseismic and Magnetic Imager (HMI). These instruments will be responsible for taking several measurements that will characterize how and why the Sun varies.” The instruments are designed to look at the sun simultaneously while performing an entire range of measurements. 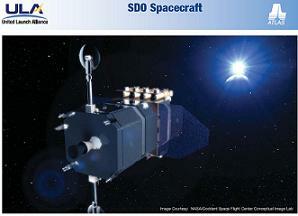 To gather these measurements, the SDO was designed to be a sun-pointing and semi-autonomous spacecraft. In this manner, near continuous scientific observations of the sun will be collected. The SDO 4.5-meters high and just over 2-meters wide on each side. The Observatory – including fuel – weighs nearly 3100kg.